Custom illustrated line drawing maps start at $500 and the cost depends on the amount of time required to draw all of the elements. Once step one is complete (see process below), an accurate quote can be estimated. Step 2: A price estimate will be quoted based off of scope of the project in step one. Step 4: A proof will be created for approval and two design revisions are included. For additional proof revisions, a fee will be applied determined by the amount of time needed for edits. Step 5: At proof approval, the map will be sent to print along with the other elements of the wedding invitation and the second half of the payment will be due. They can be produced in flat, thermography, foil, letterpress and engraved printing methods. Custom illustrated line drawing with watercolor maps are about 10% more than the and the cost of the line drawing maps. This quote also depends on the amount of time required to draw all of the elements. Once step one is complete (see process below), an accurate quote can be estimated. The process starts exactly the same as the line drawing map (steps 1 -4), before the watercolor phase begins. Step 5: Once the line drawing layout is final and approved, the watercolor touches will be added. The proof with watercolor can be tweaked until approved to print, but revision fees will be applied based off of the time required. 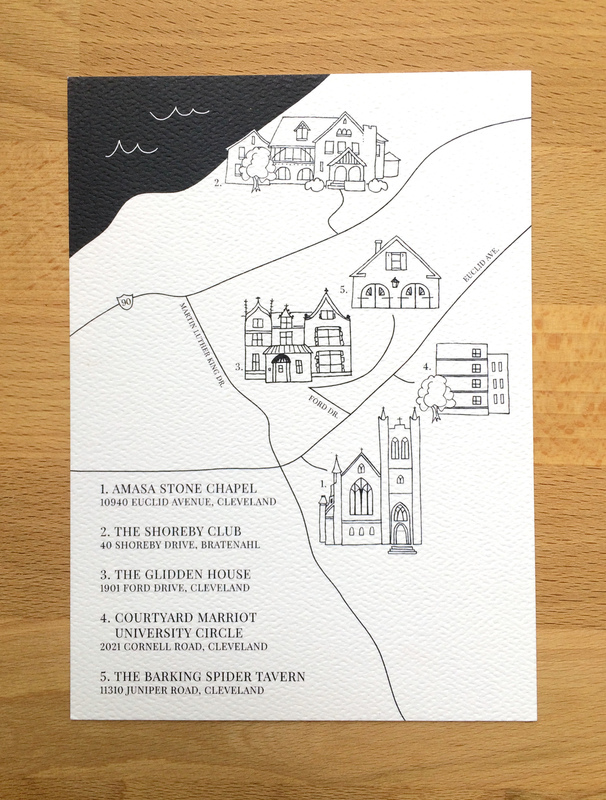 Step 6: At proof approval, the map will be sent to print along with the other elements of the wedding invitation and the second half of the payment will be due. They can only be produced with the flat printing method and can not be foil, letterpress or engraved. Custom illustrated all watercolor maps are about 50% more than the and the cost of the line drawing maps. This quote also depends on the amount of time required to draw all of the elements. Once step one is complete (see process below), an accurate quote can be estimated. The process starts exactly the same as the line drawing map (steps 1-4), before the watercolor phase begins. Step 5: Once the line drawing layout is final and approved, the watercolor phase begins. The line drawing will be used as a sketch or outline for the map's layout. The map will be created to follow the line drawing exactly and layout edits can not be made easily once the watercolor phase has started, so it is important to work from a final layout. The watercolor proof can be tweaked until approved to print, but revision fees will be applied based off of the time required.